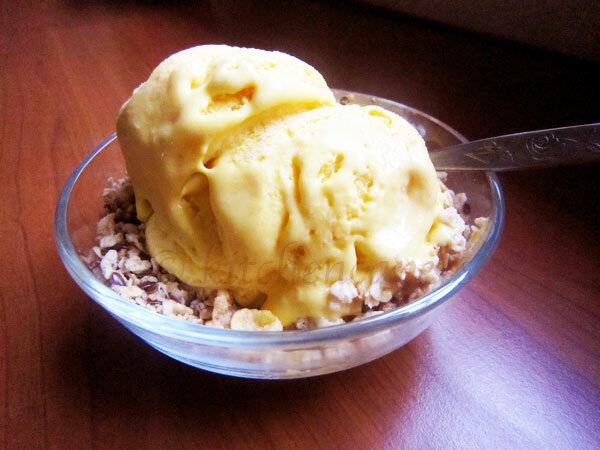 This is the 'easier' version of the Mango Ice cream. The texture is very smooth like gelato. I made 2kg and serve so many people with it..Mostly students and also my neigbhours(at my shop next door). 1. Put frozen puree, thickened cream and icing sugar in a bowl and blend till smooth. 2. Freeze for 4 hours..serve with loads of granola or dried fruits.. I use the Bamix Blender(hand held) to do this. If not, just use a food processor/blender for this. Don't thaw the frozen puree and whip using the mixer..the water condensation will cause this ice cream to turn into crystals later on..